Nathan Coulter-Nile will undergo tests after suffering vertigo during Perth Scorchers BBL match against Adelaide Strikers. Coulter-Nile showed discomfort after bowling the penultimate ball of his fourth over. He managed to deliver his final ball but was then in considerable distress as he was attended to by the physio and doctor before being able to walk off the field. After spending time in the dressing room he was sent to hospital as a precaution before being well enough to travel back to Perth with the team on Sunday, but will have further tests having previously suffered from the problem. 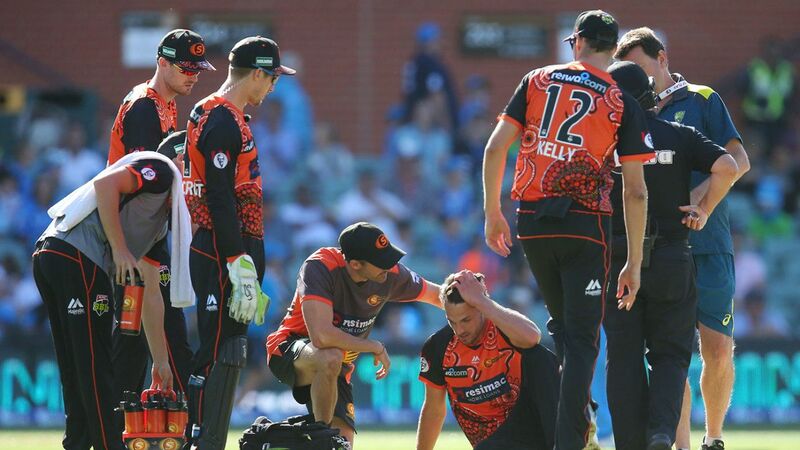 "They put him on an IV drip and he was feeling well enough to travel with us today, which is good," Scorchers coach Adam Voges said as the squad arrived back in Perth. "Its something hes had before in the past. Its normally taken a day or two for it to settle down. Hopefully thats the case and theres nothing more sinister than that. "Its very random and came out of the blue. Im just glad he was discharged from hospital last night. He still doesnt look great and hes not 100 percent but hes certainly feeling a lot better than he was and Im sure hes glad to be home. "[The doctors suggested] because he has had it in the past, he is prone to perhaps getting more episodes, but well send him to some medical teams this week and see if theres any other investigation that needs to happen." Coulter-Nile is part of Australias squad for the tour of India and is due to depart next Monday for two T20Is and five ODIs as he looks to further push his claims for a World Cup spot in the absence of Mitchell Starc and Josh Hazlewood due to injury.